Professional wrestler (and one-time Staten Island resident) "Macho Man" Randy Savage (born Randall Mario Poffo) died Friday while driving in Florida. Early reports say he suffered a heart attack while driving and then crashed the car. His wife was also in the car and suffered minor injuries. Savage was 58. 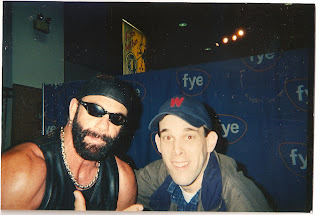 Oddly enough, of the Poffo boys, I was probably more of a fan of Leapin' Lanny (also known as The Genius). But there was no denying the awesomeness of the Macho Man, coming to the ring to the strains of "Pomp and Circumstance" (thus making everyone's graduation a little cooler) and later flying from the top rope in his three-star wrestling trunks and landing that elbow time after time. Men of a certain age (mine) will fondly recall his match with Ricky "The Dragon" Steamboat at Wrestlemania 3 as being one of their all-time favorites. I had the pleasure of meeting the Macho Man when he was promoting his rap CD (yes, that's right) at the FYE in NYC. That moment is captured above, and, despite the fact the photo was taken when I was 26, it is probably the most youthful and excited I've ever looked in a picture. I guess all those flying elbow drops meant more to me than I'd thought. How Does It Hold Up? : No weak tracks, some ever so slightly dated. You would have a hard time convincing a sane, functional human being that Cocktail is a great movie. You could maybe, with the help of a few cocktails, make the case for it being a good movie in that odd 80s sort of way where it is of a time, and, really, it's not even close to being Tom Cruise's worst movie. Then again, there's this, which might be the World's Greatest Advertisement For Never Leaving Your House to Spend a Night in a Bar. Ever. Yet, as difficult as it is to tout Cocktail's place among cinema's finest works, it is almost equally as easy to declare its soundtrack one of the all-time greats in the genre. Or at least it's easy to me. And this is my blog, so let's just assume that my opinion also belongs to every living person. It will make things simpler, and I'm pretty confident it's true anyway. I couldn't possibly have seen Cocktail when it came out in 1988, as I was 11 and not regularly seeing R-rated movies at the time (though I think my first in a theater--the classic Carl Weathers/Vanity star vehicle Action Jackson--was around this time), and certainly not ones with Tom Cruise as a bartender. But because of the big radio and MTV hits, I was all in for the soundtrack. I actually wore out my cassette copy back in the day (see above) and, when I found a CD copy in the used bin for a couple of bucks recently, I gladly added it to my collection. As I listen to it as I write, I feel confident that it holds its place as one of my Top 5 all-time favorite soundtracks. Part of that can, of course, be credited to nostalgia, but part of it is legitimate, untainted affection. The soundtrack has a little bit of everything: new stuff by unknown artists, cover versions of old stuff (including Ry Cooder's "All Shook Up," playing in the background of the scene above...don't feel obligated to watch it again if you missed it the first time), new stuff by well-known artists, and even "Tutti Frutti," which is a can't-miss add-on. The whole thing starts off with a Starship song, so it's an uphill climb from the get-go. If you don't want to listen to Starship, you can at least look at the scenes from the movie and think bad thoughts about Elisabeth Shue. Or Bryan Brown, if you prefer. Whatever floats your boat. "But Mr. Tinsel and Rot," you say, "doesn't this soundtrack also have 'Don't Worry Be Happy' and Kokomo,' two impossibly cheesy songs that I cannot defend on any level." First, please call me James; you sound stupid when you say "Mr. Tinsel and Rot." Second, if you want to pretend that you're too cool to have ever liked "Don't Worry, Be Happy" and "Kokomo," then (a) you're lying to yourself, and you really shouldn't do that, and (b) please leave. Wait, wait, come back. OK, these songs have lost a little of their sheen. But let's just forget about that and embrace our childhoods, OK? And let's enjoy the still somewhat entertaining video for "Don't Worry, Be Happy" and the time the Beach Boys sang "Kokomo" on Full House while the Tanners bopped along. And again, the '80sness of the soundtrack's two biggest hits is balanced by John Mellencamp's reasonably ambitious (if not as good as the original) cover of Buddy Holly's "Rave On", and maybe the Fabulous Thunderbirds' shining moment (I honestly think they're better than the average person gives them credit for), "Powerful Stuff." Rounding things out are the oddly hypnotic "Oh, I Love You So" by Preston Smith and Robbie Nevil's "Since When," which is good, though not quite as good as his monster hit, "C'est La Vie". But, hey, that's life. And if you didn't see that sentence coming, you're probably still angry about me questioning the greatness of Cocktail. If I only had the wit and soul of the writers who put words into the mouth of Brian Flanagan, I would now end this blog post with a classic barman poem to send you into fits of laughter and spasms of ecstasy. Alas, I am devoid of such skills. So I will just (must...resist...saying...raise a glass...) start the soundtrack playing again on my computer and enjoy the splendor of a classic album. I didn't fail at all in the mission for this batch, but that's mainly because these were, for the most part, less dense reads than the first 20, with the main exception being Thomas Paine's book (definitely the densest I've read this year, and it did feel like work at points, but there was enough in there to make the heavy lifting worth while). It was a good segment largely because I was able to knock a bunch of books, written by authors I like a lot (Elmore Leonard, Calvin Trillin, James Ellroy) that had been sitting on the shelves (or in the piles) for a long time. I had wanted to read Calvin Trillin's American Stories long before I even bought it, so I was glad to finally get that done, and to get back to reading Trillin. He's a really great profile writer, and American Stories is a strong example of that. Unfortunately, I think it's out of print, but if you ask nice, I'll consider loaning it to you. My average dipped a little, as, after finishing the 30th book, I clocked 8,748 pages over 132 days, putting me at a little over 66 pages a day. I'm still pretty pleased with that, though, and quite happy that I haven't given up on this. Number of Books on Loan: 2 (Lost Highway: Journeys and Arrivals of American Musicians by Peter Guralnick and The Miracle of St. Anthony: A Season with Coach Bob Hurley and Basketball's Most Improbable Dynasty by Adrian Wojnarowski). Thanks, Mike and Mark! Number of Books Given as Gifts: 1 (Riding the Rap by Elmore Leonard). Thanks, Frank! "Why may we not suppose that the great Father of all is pleased with a variety of devotion? and that the greatest offence we can act is that by which we seek to torment and render each other miserable? For my own part I am fully satisfied that what I am now doing, with an endeavour to conciliate mankind, to render their condition happy, to unite Nations that have hitherto been enemies, and to extirpate the horrid practice of war, and break the chains of slavery and oppression, is acceptable in his sight; and being the best service I can perform I act it cheerfully." The twice-yearly "Should I really go and spend all that money at Chiller?" debate began a few months ago when the first guests were announced. It was a strong start, though most of the interesting guests (Susan Olsen, Mike Lookinland, T&R Hall of Famer and the people's Celebrity Apprentice Gary Busey) were people I'd already "met." Of course, since I'd already "met" them, that meant I had pictures with them--pictures I could get signed and lovingly framed so that my apartment can look like a Famiglia pizzeria. And, really, that's sort of always been the goal I've been striving for. Robert Romanus (Damone from Fast Times at Ridgemont High) was another good add, and the return of Ernest Borgnine, whom I'd passed on last time he attended Chiller, gave me a chance to right a previous wrong and add a signed Marty photo to my collection (see Marty if you haven't, unless you've had a pain-free, love-filled life, in which case you probably won't enjoy it). But I was still on the fence. Then came two big adds. The first was Tommy Morrison, better known to me as Tommy "The Machine" Gunn (though I did follow his boxing career and was legitimately bummed when Ray Mercer pummeled him). It would be almost impossible to pass up the opportunity to be that close to someone from Rocky V, easily the Rocky movie I've seen the most (note that this does not mean I think it's the best; I assure you I'm not that deranged). Sure, Mr. Morrison is quite possibly crazy now, believing that not only was his HIV-positive diagnosis wrong but also that HIV doesn't even exist. And, oh yeah, he teleported once. I am not making any of that up. Anyway, if I'm gonna let a person's alleged out-to-lunch craziness stop me from handing over money for an autograph and photo, then, really, this blog's gonna be even duller than it already is. So, Tommy Morrison's inclusion confirmed my appearance at Chiller. Then, as a bonus, and in a booking I still don't quite understand, Tony Clifton--Andy Kaufman's lounge-singer alter ego that lives on now allegedly perhaps maybe courtesy of Bob Zmuda--was added to the bill. I had no idea if anyone was going to be willing to pay for a Tony Clifton autograph (except me, of course, because I had pictures from Mr. Clifton's Santos Party House show that I thought might look nice signed), but a photo with sounded like an idea I'd be willing to pursue. And now you know why I went to Chiller last Friday. My first stop after I arrived at the surprisingly uncrowded Parsippany Hilton was at Gary Busey's table. As I walked down the hallway to get in line, I heard a big-boned gentleman ranting and raving about Mr. Busey for some reason, punctuating his disgust by shouting, "And that's why he got kicked off Celebrity Apprentice!" This, of course, made me more eager to get in line to see what Mr. Busey was doing that was so offensive. Unfortunately, two minutes before I got to the front of the line to go into the room where Mr. Busey was signing (and roughly an hour after the show started), Mr. Busey decided it was time to take a break. For about 30 minutes. So I spent those 30 minutes in the room watching Alex Winter (Bill S. Preston from Wyld Stallyns, of course) and Heather Langenkamp (from Just the Ten of Us, or, more important to the Chiller attendee, Nightmare on Elm Street) cordially greet fans and hoping Jake Busey wouldn't ask me (as he did the other people waiting for Papa Busey) if I wanted to listen to his band's music. Ernest Borgnine is the coolest 94-year-old I've ever met. Friendly with everyone (despite fighting a cold) and downright jubilant in every picture I've seen of him with others. You can't see it now, but you'll likely see our picture by the end of the year. Tony Clifton was a few tables down from Mr. Borgnine and Loni Anderson (and, oddly, right between Pat "Marilyn Munster" Priest and Butch "Eddie Munster" Patrick) and was, not surprisingly, doing almost no business. So when I arrived with my photo, there was much rejoicing among Mr. Clifton and his manager. We reminisced about the Santos show (the longest they ever did, somewhere around four hours...and, yes, I stayed for the whole thing), talked about the Atlantic City show I missed (Mr. Clifton shared a joke he told to scare away the elderly members of the crowd), and generally had a very pleasant conversation, or as pleasant a conversation as you can have with a guy playing a character. Actually, it might have been the highlight of my night. And it's certainly one of my favorite inscriptions on a photo. And, yes, despite the fact that this isn't Andy Kaufman as Tony Clifton, this picture makes me so happy I can't even tell you. As I made my way out of the pit, I was stopped by a guy who wanted to know about my interaction with Mr. Clifton, since I was the first person he'd seen buy an autograph from him all night. He wanted to know if he was hurling insults, if he was really Bob Zmuda, and, if so, why wasn't he signing "Bob Zmuda as Tony Clifton," or something like that? He said he just thought it was odd that he was signing as a character and not as a real person. I thought of relating to him that it was odd that we were in a hotel lobby in New Jersey on a Friday night, forking over money to "celebrities" most of the world wouldn't know existed and that we were, in fact, roughly 20 feet away from "Fake Jan" from The Brady Bunch Variety Hour, who was doing a steady business, but I figured that was a little too deep of a thought for the evening. Soon, I moved on to this Chiller's "Yes, for $10 I Will Take a Photo With You Because I Liked You in That One Thing I Saw You In" winner, the one-degree-from-Zabka Joyce Hyser, better known as devoted journalist/male impersonator Terry from the brilliant '80s film Just One of the Guys. She earned a lustful "She hasn't aged one bit" from a guy I passed on my way out. And now we come to my encounter with Mr. Morrison. As I approached the table and examined the items for sale (a signed boxing glove [$30], signed red, white, and blue boxing shorts [$50], a wide selection of Rocky V photos [$20]), I recalled the many times I'd been on line behind someone who requested a movie/TV show quote from a celebrity on their signed photo. Sometimes I find this to be a brilliant idea, and sometimes I find it to just be annoying (whoa, I think I just described my life). But I'd never tried it myself. And, since one of the photos was from Rocky V's concluding fight scene and I knew almost every line from that scene, I figured now might be the time. "Hey, Tommy, would you mind writing 'I aint nobody's robot' on it?" He snickered. And then did it. So awesome. I briefly panicked a few minutes later when I thought I might have flubbed the line (was it "robot" or "puppet"?...surely he wouldn't know and would just sign whatever I told him), but a viewing when I returned home confirmed the total awesomeness of the above photo. Less awesome is the photo below, in which Mr. Morrison grabbed the woman he was talking to and said, "C'mon, get in the photo." He told me, "That's my girl," followed by something unintelligible that, if she was not actually his girl but a random woman he struck up a conversation with, I suppose could've been, "Please don't tell her about the Internet." And then the photo was taken. Those three people will never be in the same photo again. A true collector's item.